lin14534 - What is the name of the mount you got on Amazon? Paint color - Beautiful room. Didn't see this answer in the other posts. Can you please tell me the paint color for the walls, I am looking for a subtle blue/gray. Thank you! i like the idea of placing a plasma on top of the fireplace, my worry is doesn't the fire affect things placed - fire has smoke and I feel it might ruin the tv, pictures and flowers placed next to the fireplace. Plase advise me on that, I really like the idea since it saves space, no need to buy the units for plasma, books and other things. You just make a built in in one place and you can also put your sound system in the units without displaying so many speakers outside the units. I think of more concern than heat or smoke is the height of the TV. Your seating would have to be a distance away from the fireplace to have your head at a comfortable angle for viewing. Most homeowners don’t have that kind of room. Maybe mounting the TV on a moveable hinged Mount that allows the TV to be pulled out and down for viewing. Otherwise, too uncomfortable. Looks very nice! Where is your cable box, dvd, etc and how did you hide all of your wires for them? Thanks! Thank you so much, hendrbr. We were really trying to figure out how to make this all work.. and not super technical savvy. What kind of fireplace? Wood or gas? brand? Size? Julie it is beautiful. We are adding a room to our house and I loved your design. How do you hide all the cables for your television and cable? That appears to be a Majestic Full View fireplace. I love the wall, mantel and trim colors. Can you tell me what they are? Hi, forgive me if this has been asked already but do you know which model Town & Country fireplace this is? Love this one and would love to purchase the same one but not sure...is it the TC42 model? Thanks! I went on the site and it is the TC42 model ! I hope this helps! I am looking for something that looks like this that is Electric.. Any suggestions? What - Is the Paint color of the walls? Just wanted to say that I LOVE that fireplace! What did you do for power receptacle for the TV? - Where did it thread to? The fireplace inset is made by Town and Country, the tv equipment is in the lower left base cabinet and the TV cable goes to there. Fireplace, gas or wood burning? - Hi, is that a direct vent fireplace? If so, who is it made by Town & Country, Heat & Glo or Lennox? What is the size? Thanks so much! The fireplace unit looks like an Isokern (EarthCore). We are installing now. You can burn gas logs or wood. The larger Magnum series are 42" width. You select the firebrick and pattern so it is customized to your preferences. What movie is that scene on TV from? - I can't remember the film but I know I have seen it. 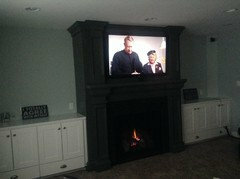 Beautiful integration of fireplace, tv, and cabinetry. 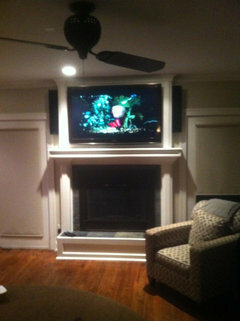 - It's hard to make a tv look good over a fireplace, but you've done it here by unifying them with the cabinetry. Excellent balance and sense of proportion. Love it! Mantel & Base Cabinet Height - Please provide mantel height and base cabinet height again. I have scrolled through everything but cannot find where you answered this. How big is the entire fireplace wall? What color is the wood mantle around the fireplace and tv - What is the color around the tv and fireplace? I my doors were Quarry Rock, would trim be OC-21? I do not mean to sound dense, but are you asking about interior paint colors for doors or cabinet colors? Because if you are speaking about interior doors, like a bedroom door for example, that would be a very strong color unless the surrounding walls are also deep in color or the same color. We tend to keep interior walls light, trim light and accent items like shown in the picture. Important to note that the adjacent kitchen island is this same color as well as a custom desk piece behind, so this rich color is repeated and supported by other colors that are just as rich. Yes. I did mean interior doors like bedroom doors, interior french doors, etc. I've seen black interior and also dark gray doors so, I was just wondering if the trim around those doors is usually painted. I'm sorry for the confusion. Thanks for your response, though. I suggest you speak to a salesperson at your local fireplace store. Congratulations on this design and the interest in it, Julie. For people who are looking for real heat from a fireplace, I believe that it actually comes from a different type of insert. This one is beautiful and lends a cozy ambiance to the room. Heat is a different concern. With a gas fireplace, the glass cover panel actually radiates more heat into the room than you gain from having the fireplace open. With a woodburning fireplace, the series of inserts from Fireplace Xtrordinair do a fantastic job! They are a closed system that recirculates the heat into the home, but with a glass door, you can enjoy the cheery flames. I've had one for 20+ years--one of the best decisions we made when building our home (in cold country). You could put one into Julie's fireplace design as well. Could you tell me how wide the built-ins are on each side please? Not a good idea to mount a TV over a fire place, for obvious reasons. I find it interesting how many time we see the TV over the fireplace when what is mentioned above is absolutely right. The heat from the flu it not so much a problem as is soot from a real wood burning fire place. And yes, looking up requires a consistent use of eye muscles making it less relaxing to watch TV. Fireplace. - Love this look. The firebox looks bigger than some. Would you please tell me where it came from and the style number or name. Thank you so much! Could I have the wall color please? Thank you! Tv - I saw a question asking the size of the tv and the answer said to hit info and find the answer but I do not see it anywhere. Would u happen to know the size? Ty. You have amazing taste in decorating! Do you know where I can buy the bookcases? What size casings did you use (baseboard, window, and crown)? How tall are the ceilings? you can purchase this from us, they are custom made to your measurements. Julie - thanks for your prompt response to my inquiry. I actually like the size and color of the round ottoman in the picture. Is it leather? Hard to tell from picture. If I did order it - can you give me an approximate price and other leather color options? Thanks again. what is the paint color on the wall above the bookcase? - Looks like a accent color to the paint on the fireplace. Is it BenjMoore? And what number if possible. What is the paint color of the fireplace surround? This is gorgeous! We are in the first stages of renovating our family room. Do you think this would darker surround would look good in my setting? It's a bit bold- but I love it! No where near dove white Shabby Nest, this has a blue green, it is as listed above #1556 Vapor Trails by Benjamin Moore. I am doing my basement over and Vapor Trails was my first sample color. I have cherry floors and a very white (grey undertone) new drop ceiling. My staircase is carpeted in the same color as the owner's chair in your living room. I have about 10 sample paints, but I'm being haunted by Vapor Trails. I love blue/greens and I think of this color as a neutral, looking great with dark brown, any blue green and even a yellow green. Help.....do you agree, or am I hallucinating, which wouldn't surprise me, given all the paint colors I've looked at!! Does anyone know the color of the stone around the fireplace; presumably it is granite? What paint colors were used on the fireplace and the bookshelves? Paint around fireplace is Benjamin Moore Quarry Rock #1568. Fireplace Not Centered - I love this room! I'm currently remodeling family room which required repositioning fireplace to accommodate two white bookshelves with bottom drawers on either side, and TV above, similar to this room. I just discovered that my contractor didn't quite center fireplace. It's 3/4" wider on right side. How would you correct this? More filler? He can't center now as framing has been done. Will it be noticeable? Thanks! Thank you! It's actually the fireplace not centered causing the difference. My contractor explained that he made that call because walls on either side are bowed and the cabinet installer will have to be a little creative with the filler. I don't know if this question has been asked, sorry if it was, but was is the depth of bookshelves and lower cabinets, please? Then your contractor should be able to furr out one side to create an equal reveal on each side of the fireplace insert. please consult your equipment specs (DVD, Cable box, Apple TV, etc) and make your cabinets the depth required to house your equipment. the bookshelves are 15" deep. On your Tiburon designed fireplace; how wide is the wood around firepl - Trying to copy your fireplace, how wide is the trim around fireplace? On the paint, what part is painted what color? Mantle, wood on the side Of fireplace, framing around TV ? Is the mantle a separate color from everything else? Hopefully I'm not leaving anything to guess. I appreciate your wonderful design. All the wood work surrounding the fireplace is painted the same color, the immediate surround is Labrodite jade quartzite stone and it is approx 7" wide. The painted "legs" under the mantle are approx 6" wide in the front and 9" in the back, if you look closely you can see it is a stepped design. I suggest you work with a carpenter to assist you in recreating this look. The TV is set back from the front of the mantle at least 6" the manufacturers specifications need to be consulted so you are meeting their requirements for combustible surface proximity. Can you tell me what the black trim around the fireplace is? Did granite fabricators install it or carpenter? Cable box - Love the fireplace m TV but where did you but the cable box? Love you work on this tv bookcase. We are looking to do this in a room that already has a fireplace on a separate wall. What would you recommend putting below this tv in place of the fireplace? We are revamping an existing bookshelf and would love to use this same design. is this a gas fire place? Is that granite on the surround? I am redoing our fireplace and bookca - Thank you! It is granite on the fireplace surround. The material is labradorite jade polished. Thank you!!! Love this look! Can't wait to see mine finished! Position of TV - Is it comfortable watching the tv that high up? You are incredibly talented! Wish you lived on the EAST coast! Love this fireplace/tv combo. Where does one put the DISH receiver/DVR in such a set up? I love the TV concept. Did you have to consult with an expert regarding the heat ruining the T.V.? - Are there any measures that can be taken to ensure that the T.V. will not be affected due to the heat radiating from the fire? Where are the digital boxes stored for the t.v.? What is the cabinet door style used on the white portion of the bookcase? How tall and wide are the cabinets? 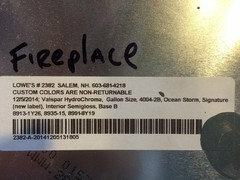 Are they standard base cabinet 36x24? Does Houzz seel the cabinetry shown in the photo? What color is trim and bookcases? Did you mean AC-21? I love this color too. Just wanted to check. The trim is OC-21. When I looked up the AC-21 it is a green so I figured you like the fireplace color which is BM 1568 quarry rock. Does anyone know the exact color of the fireplace. It looks like it has some green or blue in it. Thanks. The paint color around the fireplace is a custom mixed color using Benjamin Moore paints, it does have blue, green and gray in the mix. The picture above the fireplace is actually a TV with a still from a movie we paused. Stone around fireplace is Labradorite Jade - it's a quartz. Height of TV is comfortable. No problem watching (no neck strain) even for little ones. Fireplace paint is Benjamin Moore - Quarry Rock #1568 High Gloss Enamel. Can plans to build be obtained? - Where can you get plans? Thank you for your question, yes you can purchase plans, we would need to adjust to your site, can you provide a detailed measure of your space? we can give you a price for the plans once we know the level of work involved. Where is your project located? This is gorgeous. We are painting our fireplace and kitchen cabinets. I have purchased a Navy gloss paint but I'm concerned that I won't get this soft look. What paint finish would you suggest for fireplace and kitchen? What fireplace is this? - manufacturer and model? I now see that this is a Town and Country fireplace. Can you please tell me the specific model? Is it a direct vent? I am sorry I do not know the exact model, it is a direct vent though. Yes I think it would, but be careful picking colors online, please read this insightful article about the true color which is not represented online. What color is on the wall? Looks bluish grey? I would appreciate knowing the size of the opening of the gas insert. The fireplace insert is 42" wide. The interior designer supplied the furniture. Thank you for responding. Would you mind asking where she got it and if it has a name or manufacturer? Where is this fireplace available? mkbueller.....That looks like a gas, zero clearence fireplace. The herringbone design looks like one I've seen from Napoleon. What is the fireplace trim? - What is the lower trim surface around fireplace? The fireplace was a custom cabinetry piece we had made by a cabinetry manufacturer. It came in two pieces ready to install on the wall. Maybe you are asking about the material directly around the firebox? That is Labrodite jade stone, it is also used on the hearth. We designed this wall specifically for our client's space. This picture is great for inspiring an idea and then modifying it for your space. I looked at your photo, painting just the fireplace would certainly pop it as a focal point. You might also consider painting the lower cabinets. However our project repeated this color in the adjacent kitchen island, as well as small accent colors that repeat the color throughout the space. So think about how you might do the same. Fireplace Insert - Is that insert covered by the stone along the edges or is it slim like that? Who is the manufacturer? Gorgeous! The fireplace is by Town and Country. The insert is surrounded by stone but it has a slim surround. Thank you! Is it a gas log or a full gas insert? The tv cabinet is approximately 3" deep. and what is the standard depth for cabinet? The ceiling in this project is not 10', sorry. That should not present a problem; just adjust the size to fit your requirements. What colors are on walls and builtins? It's lovely! Paint color on fireplace mantel is Benjamin Moore #1568 Quarry Rock. The trim is Benjamin Moore OC-21. The bookcases are prefinished by the cabinet manufacturer, white with a pewter glaze. The walls around the bookcases are Benjamin Moore's 1556 Vapor Trails. Mantle - Hi, was the mantle custom made or purchased somewhere. Really like the look. Great Job! Thank you for the compliment. The fireplace surround was custom made by Crystal Cabinetry from our dimensions. Do you have shop drawings of the fireplace surround? If so would you be willing to send them to me? Is the tv recessed or is it an illusion? The tv is recessed, it is not an illusion. Ceiling Height - This fireplace is amazing! Would you do this same layout (darker vertical accent floor to ceiling molding/dark granite) if the ceiling heights were lower, say 8' tall? Or would you only do this with a taller ceiling? This fireplace was a custom design for this room's specific dimensions. Removing 12" to accommodate a lower ceiling can be done but at the expense of the proportions. wHAT IS THE YELLOW FABRIC ON CHAIR??? wHERE TO PURCHASE? The client hired an interior designer for the furniture. Surround - I'm assuming the surround was custom built. Do you know what components were used? The cabinetry was designed on paper and made by the cabinet manufacturer, it is not made up of a list of components. What color is the mantle? It is beautiful. where do you put satellite box when you put a tv above the fireplace? This client didn't have satellite television but all of the components are behind the bookcase doors. Is the surround for the tv and everything else made from mdf or has it been boarded and skimmed. ? Also do you have any progress pics of the whole project from start to finish. ? Is this a gas fireplace? What brand? This is a gas insert by Town & Country. Where did you get the one piece slate for the hearth of the fireplace? What is the width of the wall that the fireplace and mantel are on? - We are duplicating the look of this design. We are curious to know the width of the entire green section including mantel. Thanks! The fieplace overall wall size is 12'11". The fireplace including mantel is 73 1/2" wide. We love this look! We are renovating our house and we won't to duplicate the fireplace, mantle, TV and built-ins. What size TV is this? How is the back of the TV acessed? - I love the TV housing I have an electric fire place with a recessed hole above designed to house a TV so I have no heat concerns. I am planning to finish the hole with molding and was considering an articulated wall mount to adjust and access the back of the TV. Is this what you used for this design? Also did you paint the cavity behind the TV? Did the design include any acoustical considerations? Thank you, your design has been great inspiration. Thank you for the comment. This television is wall mounted, it is not on an arm. The back of the opening is painted to match the surround. how deep is the TV recess? I am not clear on what you are asking for? Hi Mrs. Williams, I love your fireplace and shelves. The bookcase are 44"W x 90"H and 37 1/2"W x 90"H.
I love this setup! Beautiful! What was your reason for not centering the fireplace? tv over fireplace - if we put the tv over the fireplace would we still be able to use the fireplace? It is wood burning. Thank you. The television manufacturer you select should be consulted about their specifications. The chair was the owners and was reupholstered, the ottoman was custom. Where did you go for the custom ottoman and what diameter is it? Love the look! Media components? - Where are all the media components(cable box, dvd player, apple tv, etc)housed? Are there extra accessories needed to run these (other than cables behind walls) wirelessly? Thanks! The components are behind the doors. Do you have to have a wireless cable box (I know u-verse now sells but hate at&T) to change the channels. How does it work if the box is hidden in the cabinets. Dimensions - What are the dimensions of the fireplace and tv? How high off the ground is the mantle and the TV? Thank you! I was wondering how I will find a good person to hire, if I were trying to wire a TV above my fireplace like the one above. My home was built in the early 1900's...... so I'm thinking this may be hard to accomplish. LOVE THE MANTEL! WHERE CAN I GET IT? This was custom designed and built on-site. A good carpenter can replicate this for you. Any possibility of getting the profile/detail on the mantel? Have client who wants to duplicate. What color is the white trim? - I have a lot of trim that I'm about to paint white & this is a nice color without pink undertones. Thanks! The trim is Benjamin Moore OC-21. Thank you! Love love love the look of this fireplace with the TV & the colors. What is the top of the cabinet part made of? - Is it just wood painted like the shelves or something else? The crown is painted wood, the same color as the cabinetry. Thanks for the quick answer. We are putting built-ins around my fireplace and couldn't decide what to do with the top. I just love the look of this! What size TV is shown in the picture? Any other pictures? - Do you have any other pictures of this fire place? I am remodeling our fire place and really like the looks of this one. I was wondering what molding was used around the mantle and around the tv. Thanks I can give you my email if you need it. This is the only picture of the fireplace. The surround was manufactured by Crystal Cabinetry rather than from stock material. I was wondering about other photos as well. I absolutely love this. I'd be curious to see a photo with the TV off. One of the reasons this particular picture is so beautiful is because the image on the screen looks like a piece of art. I'm sure with the TV off it's still beautiful because of the fine craftsmanship of the fireplace, but it would be helpful to see how it looks with just the black screen. I recommend you talk to a local contractor and get an estimate to do this. Every home is different and your existing fireplace, believe it or not, is unique. These need to be inspected and each case may require different solutions. Ours was simple. We had a wood burning fireplace with gas to it for starting the fire. Just measured up, went to store with "gas logs" and got advice on appropriate size and had a plumber install. Did this at my Mom's and daughter's. Both are delighted with their new fireplaces. tv over fireplace - how far out is the tv from the fireplace backing? or rather the brick above the fireplace opening? The tv is proud of the fireplace brick by two inches. Love the chair- can you tell me where it is from? What fabric was used to re-upholster the chair? Great texture and colour! Ceiling height - What is the ceiling height in this room? The celing height is approximately 9'. Do you know the size/style of the baseboards, trim, and moulding? does anyone know where i can plans to build this? Planned on sight free form. I am sorry but you cannot buy plans for this type of installation as it needs to be custom designed and fit to your room, your fireplace and your TV. I would recommend looking for a designer to help you lay out your space so the proportions and scale work for your home. The mantle is approx 54" from the floor, the firebox is 36" x 36"
Yes you can re-build a fireplace to create a deeper surround, however the firebox would have to be carefully designed to make sure it facilitates proper smoke exhaust up the chimney, or you could convert to a direct vent gas appliance like this client did. Personally I think this is the best of both worlds, you get a beautiful fire, heat and no mess or ashes to clean up. Bonus is it can turn on and off with the flick of a button. Evansville, iN - Which model Xraordinaire fireplace is this one pictured? The client selected this directly, I do not have any information on what model. Love the fireplace! What model from Town & Country? - Hi, forgive me if this has been asked already but do you know which model Town & Country fireplace this is? Love this one and would love to purchase the same one but not sure...is it the TC42 model? Thanks! I am sorry I do not have that information, I do not have the exact model number, the client worked directly with a fireplace store and chose her model with them, we just designed the room and the surrounds. The cabinetry on the sides of the fireplace would run you approx $7k - $10K depending on how much you customize and the actual sizes of the units, plus installation. This does not include the fireplace insert or trim work done around the fireplace. So all in, you are looking at $18k - 20K for the whole wall, installed. Of course this is only an estimate based on materials and labor rates in our area. Pricing - How much is something like these cabinets? Fireplace Surround Dimensions - What is the overall width & height of the entire fireplace surround? As previously answered: The length of this whole wall is approx 12'-11", the fireplace is taking up a little over 6'. The base cabinets are 45" on the left and 38" on the right, they are 20" deep and the upper open shelves are 13" deep. Wall dimensions - What is the length of that wall from built in edge to built in edge? the total wall length on the above photo is 12'-11". Paint - What is the name of the paint color? Thank you for your question, but this was previously asked and answered. so we sincerely appreciate it when you review the available information. Is that a TV? - How did you get it above the fireplace? And just added curiosity what are you watching? Yes, it is a TV and the movie is Mansfield Park (1999, Patricia Rozema directed). If you click on the MORE INFO button directly under the image, you can see lots of comments about TV's above fireplaces. Heat protection - How did you protect the tv from the heat coming from the fireplace? The television is set back considerably plus there is a mantle protruding below the TV, so there is no heat blowing on the TV itself. Follow manufacturers specifications for installation of fireplace units and clearances to combustible surfaces and consult with an Audio Visual specialist to properly advise on installation requirements for equipment. How wide are the shelves on the right?? Where are the tv electronics - This is beautiful! Where are the cable box, blue ray player, etcetera? I am wanting to do something similar,but need suggestions for keeping all of the components and wiring out of view. Built in details - Is there a countertop material between the cabinet and the shelves? Yes, there is a wood top matching the cabinets between the upper and lower. Dimensions? - How far does the woodwork around the fireplace extend beyond the Sheetrock around the bookshelves? I am not sure I understand your question? but fireplace surround and mantle do not extend into the bookcase area, it returns onto the sheetrock before the built-ins. Mantle height - How high is the mantle from the floor up to the top of the mantle? The mantle is approximately 52" above the floor. how far out does fireplace come into room? - how far out does fireplace come into room? I am not sure if you are asking how far out the mantle protrudes or the actual firebox? The front of the stone on the fireplace is approx. 24" from the back wall, the mantle surround protrudes further approx 6"-8" further. The built-ins on the sides are approx 21" deep off the back wall. What is the width of this bookshelf? The fireplace is Town & Country's TC36. The steel frame around the fireplace in front is 38 1/2"W x 36 1/8"H x 24"D, in back it is 26"W.
Paint color - What is the paint color of the modeling around the fireplace/tv? Benjamin Moore #1568 Quarry Rock is the fireplace surround. The cabinets we ordered through Crystal Cabinetry. Hanging pictures above TV. - TV is 50" flat screen. Pictures are about 28 by 30. They would be about 10 feet up on the wall in a room with 18 foot ceilings. My husband wants to hang them above TV but I'm not sure it would work, what suggestion do you have? If you aren't sure, try drawing the walls to scale, cut out the tv and pictures, also to scale. You can then place the items on the walls rearranging them to see what you like the best. It is in the cabinet on the lower left. We used a remote eye to trigger the various components in the cabinet. This is a small sensor that is mounted on the side of the TV and wirelessly connects to a flashing unit in the cabinet. This allows you to aim your various remotes at the sensor and the sensor speaks to the applicable equipment in the closed cabinet. Speak to a knowledgeable audio visual consultant who can point you in the right direction. Why is this photo always in "latest activity"? You have thousands of n - ? Despite the fact that we actually specialize in kitchen and bath design, this photo is very popular, in fact it is probable our most liked and pinned image. Every time it is liked or added to someone's idea book, it is added to recent activity again. It is adjacent to a beautiful kitchen in a home which we redid from top to bottom. Awesome! Looking to do something similar - How wide are the bookcase and how wide is the fireplace area? I have a very similar situation where i have an existing drop header/soffit to deal with. The overall wall is 155"w x 108"h. The bookcase at the left is 44"w x 90"h. the bookcase at eh right is 37 1/2"w x 90"h. The television surround is 61.5"w x 108"h.
Ottoman - Where can I buy this ottoman? Beautiful space! I am sorry but the interior designer on the project supplied the ottoman. We supplied the cabinetry for the bookcases and fireplace. Enhance features. If there's something you love in your home and want to show it even more, try enhancing it with color. By painting it a different shade, the feature — in this case a fireplace — will become the focal point. Create a relaxing and serene contrast with a deep blue-gray fireplace mantel that has a touch of green. Try Benjamin Moore's Templeton Gray for a coastal, transitional or traditional look. 1. Complete cohesion. Place the television directly on top of the fireplace and bring both of these focal draws together by surrounding them with wood and molding details in the same style.Design tip: Consider painting the backs of flanking bookcases the same color as the fireplace for further design cohesion. A mantel painted in Benjamin Moore's Quarry Rock, a labradorite stone surround and buff firebrick in a herringbone pattern beautifully combine to create a custom gas fireplace. Most fireplace mantel and mirror combinations are painted white or stained. Add another dimension to your design by painting it an accent color. Painting your surround, mantel and chimney breast a color that contrasts with the rest of the woodwork — particularly if the rest of the millwork is white — is a stellar way to bring interest and depth to your room. If the all-over-noir look is not your thing, you can also go with a touch of gray. The pros at Julie Williams Design accented the fireplace only in this wall of built-ins. 6. Make room for media. Laying out your living room furniture can be tricky. If your space calls for hanging the television over the fireplace, go with it. Then think about how to best style the spaces around the TV. Built-in bookcases can accommodate much more memorabilia than a mantel anyway. Decorate those shelves with your favorite books, photos and objects.